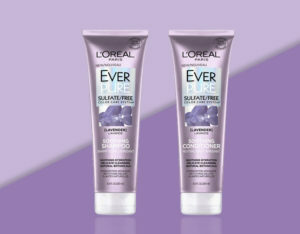 Enter for your chance to win 1 of the 200 EverPure Lavender Soothing Shampoos or Conditioners! EverPure Soothing system with lavender delicately soothes the dry scalp and leaves fine, fragile hair feeling hydrated and soft to the touch. Colour-treated hair requires special care. There are no harsh sulfates that can strip, dull and damage hair. Experience a purely sensorial lush, luxurious lather and a fresh aromatic fragrance that blooms. Ever, our original 100% sulfate-free haircare. The purest respect for your hair and scalp. Answer a few questions about your hair and be one of the first to try this new L’Oreal product.